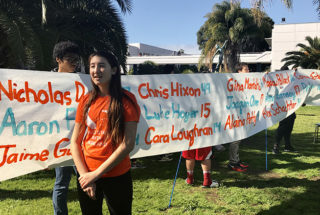 Students at Venice High School in Los Angeles join the National School Walkout movement Wednesday morning. Their banner lists the names and ages of the 17 victims of last month’s school shooting in Parkland, Florida. Concerns about their own safety mingled with students’ expressions of support for victims of school shootings, as peaceful demonstrations were held Wednesday at campuses across Los Angeles. About 2,000 students at the West Los Angeles campus walked out of their classrooms to honor the 17 victims of last month’s mass shooting at Marjory Stoneman Douglas High School in Parkland, Florida. Students in orange shirts bearing “Venice stands with Parkland” called out the names of each of the victims and placed orange flowers the desks. Tables were set up for students to pre-register to vote and sign petitions supporting stricter gun laws. A group of fifth-graders from nearby Acton Academy Venice Beach joined the high schoolers in chanting, “Protect kids not guns.” A long banner bearing the names and ages of the 17 Florida victims was anchored by a palm tree. “This is a start, and what matters is how far we’re going to continue with this until we see change,” said student Christopher Holland. The demonstrations at schools throughout the city came one day after the LA Unified school board approved a resolution to strengthen school safety. On Wednesday, three board members — Monica García, Nick Melvoin, and George McKenna — were in Washington, D.C., meeting with congressional leaders to bring students’ demands for safer schools and to lobby for more education funding. Independent charter schools across Los Angeles also joined the movement on Wednesday morning. Parents marched with more than 500 students around KIPP Raíces Elementary School, who were carrying handmade signs and chanting, “Peace and love,” “Keep us safe,” “Love not hate,” and “Más amor.” At KIPP Academy of Innovation, students used art to decorate the campus and surrounding sidewalks with messages of hope, peace, and solidarity. Camino Nuevo Charter Academy students walked onto their soccer field carrying posters of those who lost their lives to gun violence. A schoolwide kindness event is planned for March 21st. At Los Angeles Leadership Academy, where students’ artwork and poems where on display, students, parents, and staff linked arms and held a 17-minute walkout in front of the school. At Granada Hills Charter High School in the San Fernando Valley, 17 gongs sounded and students formed a giant human message, spelling out “Enough” on the football field. A teacher in Northern California, Sarah La Due, has helped organize Teachers Take Action Against Gun Violence, which has signed up nearly 5,000 teachers and developed a curriculum and other resources for teachers around gun violence. La Due is a Teach Plus Fellow and teaches seventh-grade English at Korematsu Middle School. The school, in El Cerrito in the Bay Area, on Wednesday set up a “photo booth” in the library for students to take pictures with #WhatIf signs to post to social media.